Sorry this is out of order but this age goes between the Renaissance and Industrial Age of the River Tribe. This is the first time they traveled far far east and discovered a new world. Un-like Earths there were no inhabitants but there were strange and exotic creatures as well as untamed landscapes. After the river tribe found it it became a race for land with the Grassland, Mountain and Desert tribes. By this time the Ocean, Swamp and Jungle Tribes are still to primitive and were used for slave labor by the other tribe. The only exception is the Cave tribe that used slaves for mining but did not have a navy to explore the New World. This is a typical explorer with a compass in one tentacle and a flint-lock pistol in the other. This is more advance than the hand cannon but is not as advanced as the industrial revolver. Also you might notice that the armor is much lighter than the previous age for better movement and guns were getting better. Thus being slow would not help. Also, is the feather in the helmet and later the felt hat a carryover from the renaiisance and the last of the knights so to say? that is, the last of those who wore a full body set of armor. Wow, these are such great drawings . 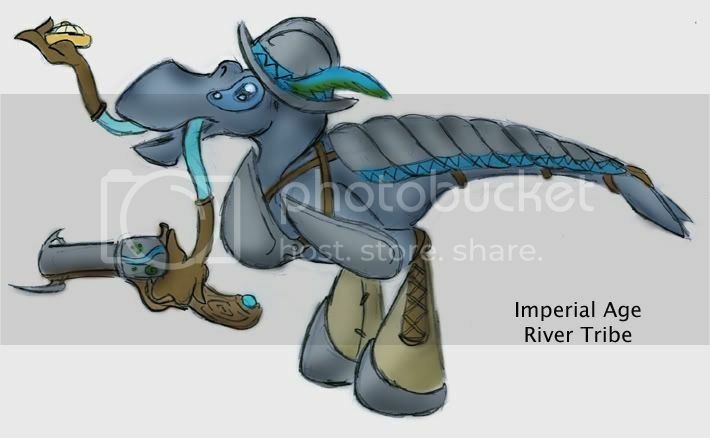 I just love the Renaissance River Tribe hand cannoneer. You have to host it. That's all I can remember right now. I use imgcity, but it's up to you which you want. P.S. Sorry to hijack your thread, Hydro, just trying to help out a fellow forumer. Here are some coins in which have evolved over the ages. As the ages improve and the higher the cost goes the more advanced the money has gotten. This is money around Imperial Age. If you look carefully you can read the numbers from my Naucean numbers. The coins come in 2 - Bone, 4 - Copper, 8 - Tin, 16 - Bronze, 24 - Iron, 32 - Silver, 64 - Gold. There is also the 80 - Platinum (not shown). Over the ages the material and styles have changed. Also depending upon the leading tribe has changed it too. Sadly by the time of the Nano Age none of these coins are used and all currency is electronic. Thus making these only collectors items. The coins dont neccesarily have to follow the same order of value as they do on earth.Gold has only artificial value because of its rarity. On naucea i'm assuming the abundance of metals matches that of earth. The ancient egyptians valued silver more highly than gold because of the abundance of gold in that area... just a thought. Although i notice iron is valued more highly than copper or tin which is a reverse of how it is on earth.